Ectopic pregnancy, a potentially life-threatening condition, represents 1-2% of all pregnancies. Tubal pregnancy represents about 95% of the cases, but other locations can occur such as ovary, uterine cervix and abdominal cavity. Abdominal pregnancy is a rare event, seen in about 1.3% of ectopic pregnancies. We present a case of abdominal pregnancy located at the Douglas pouch and superficially infiltrated the rectovaginal septum in a woman under intra-uterine device contraception. Keywords: Ectopic pregnancy; Abdominal pregnancy. Typical Meigs syndrome (MS), first described in 1937, is a rare syndrome that consists of 4 characteristics: 1) presence ovarian fibroma, 2) ascites, 3) hydrothorax and 4) complete resolution of the clinical picture after removal of the tumor1. When there is absence of hydrotorax is called atypical MS and when associated with other histological types is called pseudosyndrome. Its clinical relevance rests on the fact that it often mimics the clinical presentation of ovarian cancer, especially when it occurs in postmenopausal women, due to the higher incidence of this cancer in the 7th decade of life2. Ovarian cancer is the 7th most frequent cancer in women worldwide and is the most lethal gynecologic cancer. This is mostly related with the fact that 70-75% of all cases are diagnosed in advanced stages (III-IV), with a low five-year survival rate2. When there is clinical and radiologic suspicion of ovarian cancer, the evaluation of serum tumor markers is often performed in order to support the differential diagnosis. Serum CA125 is the most widely used tumor marker in this setting since it is increased in 90% of stage II or higher ovary epithelial tumors3. It is known that this tumor marker has low sensitivity for the diagnosis of early stages of ovarian cancer4,5 and that its diagnostic accuracy decreases significantly in women of reproductive age since it is frequently increased in different benign conditions such as inflammatory pelvic disease, endometriosis, uterine myomas and adenomyosis4. However, in postmenopausal women, its sensitivity and specificity is substantially higher, making it a more useful marker in this population of women5,6. Although there are some reported cases of MS in postmenopausal women associated with an elevated CA 125, the association with values ​​above 1000 U/ml is exceptional. The authors present a case of MS with very high levels of CA 125 as well as a review of the existing literature regarding the association between this benign syndrome and extremely elevated levels of this tumor marker in postmenopausal women. An 81-year-old nulliparous woman, presented in our hospital with complaints of progressive dyspnoea, nausea and vomiting with one week of duration. She also referred pelvic pain, anorexia and loss of 10 Kg in the previous 6 months. She had medical history of hypertension and spontaneous menopause occurred at the age of 51 years. On physical examination, she was cachectic, with a protuberant abdomen and a painless pelvic mass of hard nodular consistency extending to the umbilicus was found. Ascites was clinically evident. On pelvic investigation, speculum examination showed no abnormalities and pelvic bimanual examination revealed a bulky pelvic mass, difficult to mobilize and to determine its point of origin. Dullness to percussion and decreased breath sounds were found on the right lung field. Chest radiography revealed a right moderate pleural effusion with no other abnormalities. Abdominal and Pelvic ultrasound showed two bulky solid masses with bossed contour in the pelvic cavity, one with 136x113mm on a right paramedian location and one more posterior and left sided with 82x60mm. Moderate amount of ascites fluid was described. No other abnormal findings were described. 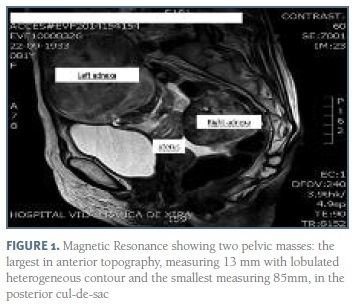 Magnetic Resonance revealed a significant amount of free fluid in the pelvis and two voluminous pelvic masses: the largest in anterior topography, measuring 136x77x118mm with lobulated heterogeneous contour and central hypersignal area and the smallest (86x62x79mm) in the posterior cul-de-sac, with similar characteristics but associated with a cystic area of 40x48mm and hypointense areas suspected of primary adnexal atypia or eventual metastization (Figure 1). Endoscopy and colonoscopy were normal. Blood tests showed no abnormal results other than extremely elevated values of serum CA125: 1172 U/ml (normal value <35 U/ml). Serum levels of both Carcinoembrionic antigen and CA 19.9 were normal. Thoracocentesis, with drainage of 900 ml of clear fluid, and pleural biopsy were performed. Both results were negative for malignancy. On the basis of clinical suspicion of ovarian malignancy an exploratory laparotomy was performed. We found a significant amount of serous ascites (1000 ml) and two solid ovarian masses, both lobulated and with whitish appearance: the left one with 14cm and the right one with 8cm (Figure 2). Bilateral adnexectomy was performed and intra-operative frozen section examination revealed histological characteristics compatible with bilateral ovarian fibroma. There were no signs of malignancy in the remaining pelvic or abdominal organs. Final histological report confirmed the presence of bilateral fibroma of the ovary and cytological analysis of ascitic fluid showed no signs of malignancy. The ascites and pleural effusion completely disappeared following surgery and the patient recovered well. CA 125 was 30 U/ml 2 months after surgery and the patient was asymptomatic one year after surgery. The clinical approach of pelvic masses is one of the greatest diagnostic challenges in gynecology with the majority of cases corresponding to benign tumors5. However, in clinical practice, the presence of anorexia, weight loss, adnexal tumor, ascites and hydrothorax in a postmenopausal woman, especially when associated with increased CA 125 values, are strongly suggestive of ovarian cancer6. Despite this, it is extremely important to remember that, although rare, some benign conditions, like MS, can mimic the clinical presentation of ovarian malignancy. Even so, given the importance of ovarian cancer, MS is always a diagnosis of exclusion, done only when malignancy has been ruled out. Since its first description in 19371, MS cases have been reported in several publications with ovarian fibroma being the most common type of tumor associated with this syndrome7,8. Ovarian fibroma is a rare benign tumor, accounting for 2-5% of ovarian tumors and its more common in women of reproductive age8. In the vast majority of cases, it appears as a unilateral mass7,8 but it may also appear as bilateral mass as presented in this case. Given its benignity, the adnexectomy is sufficient for treatment. However, when it occurs associated with ascites (10-15%) and hydrothorax (1%)8, a clinical suspicion of malignant disease is raised and there is often a tendency to perform a more invasive treatment9,10, with a consequent increased risk of morbidity. This clinical case corroborates the relevance of performing intra-operative frozen section examination since it allows the differential diagnosis between benign and malignant disease, making possible to adapt the aggressiveness of the surgery to the patient disease. Although MS has been known for more than 70 years, its etiopathogenesis remains incompletely understood.The cause of pleural effusion is also unclear but it is thought to be associated with the shift of ascitic fluid through the transdiaphragmatic lymphatic channels1. In 1989, a case of MS associated with high level of CA125 ​​was published for the first time5, with an important subsequent number of publications documenting this association after this. However, most of these cases refer to premenopausal women, being this association much less frequent in postmenopausal women. In addition, in cases in which this association is described in postmenopausal women, the elevation of serum CA 125 is generally small to moderate, and its association with values ​​above 1000 U / ml is very rare. Of all the published cases of MS in postmenopausal women with elevated serum levels of CA125, only 9 reported values greater than 1000 (Table 1). CA 125, initially described in 1983, is the most widely used tumor marker in the approach of the adnexal masses, not only for its diagnosis but also for its follow-up4,5. It is a transmembrane glycoprotein that derives from the coelomic and mullerian epithelium, and can therefore be increased in diseases affecting the pericardium, pleura, peritoneum, epithelium of the fallopian tubes, ovaries, endometrium and endocervix4. For this reason, there are different gynecological conditions, malignant and benign, that can be associated with increased values of this marker although the elevations found in the benign conditions of the ovary are generally small to moderate 4,5. Extremely high values of this tumor marker are suggestive of malignant disease, especially in postmenopausal women, where the sensitivity and specificity of this marker is significantly higher than in premenopausal women (80% and 88% versus 63% and 70 %, respectively)4,5. The precise mechanism by which this marker increases is still not fully understood. It may be due to increased production by the tumor itself or to inflammation of peritoneum cells1,8,9. Some recent studies suggest that this increase is more related to the volume of ascites than to the production by the tumor itself9,10. This case report underlines the importance of a thorough differential diagnosis of ovarian tumors in postmenopausal women, even when all the findings point to a malignant etiology. In these cases, surgery must be performed in centers with specialized teams, prepared for complete oncological surgery. The association between adnexal tumor, ascites, hydrothorax, and elevated serum CA 125 in a postmenopausal woman is highly suggestive of advanced ovarian cancer 6,11. Therefore the relevance of reporting this case rests not only on the importance of recalling that a small percentage of women with these characteristics actually have a benign disease but also for underlining the lack of accuracy of CA 125, even in postmenopausal women, noting the importance of its careful use and interpretation. Since 1989, very few cases of postmenopausal women with MS and elevated serum CA 125 have been published, with only 9 cases reporting a CA 125 greater than 1000 U/ml. We emphasize the fact that the literature review carried out in the presenting article is the first to focus only in postmenopausal women, where the sensitivity and specificity of this tumor marker is expected to be higher for malignancy. In addition, the case described is only the second one found in the literature of bilateral ovarian fibroma associated with MS.
11. Patsner B.Meigs syndrome and “false positive” preoperative serum CA-125 levels:analysis of ten cases. Eur J Gynecol Oncol 2000;21:362-363.